This piece was created as a memorial by a couple whose son died tragically. 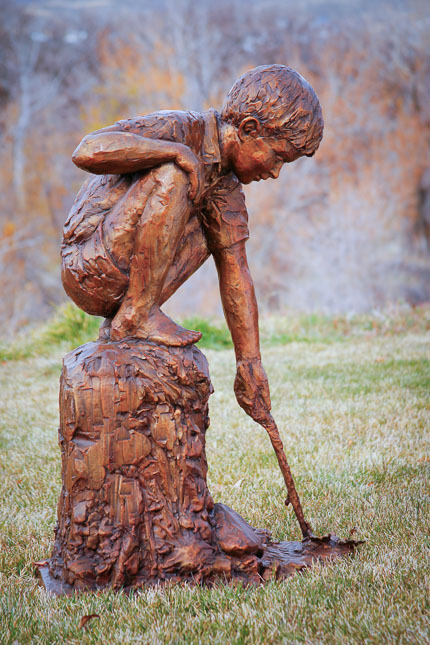 As with the Larry H. Miller award, the piece centers of the theme of vision, hope and passage. As all of us have done, the young boy sets a leaf afloat to see where the wind will take it. We watch and prod the leaf along, excited by its every twist and turn. Ultimately it path is toward the open sea where winds will take it on to adventures we can barely imagine. This piece centers, again, on a theme of vision, hope and passage. As all of us have done as children, this young boy sets a leaf afloat to see where the wind will take it. Proding the leaf along, he is excited by its every twist and turn. Ultimately, its path is toward the open sea, where winds with take it on to adventures he can barely imagine.